To his conservative co-workers, he is a commercial airline pilot, a husband and a father. His friends, however, know him as the guy in the black latex robe and top hat who likes the fetish scene. As a corporate Goth, Michael (not his real name) leads two separate lives: one as a darkly dressed clubber who enjoys the company of an open-minded community, the other as a professional man in button-down shirt and pilot's hat looking to advance in his field. "I work for a very conservative company, in a conservative profession, where people — `freaks' — who are different in appearance or actions are often the subject of open scorn and disdain," Michael says. "Most would not understand, nor accept it if they knew they had one among their ranks. The risk of ridicule or being ostracized is too great." Michael is one of many corporate Goths who frequent Toronto's club scene. They combine the lifestyle of a club kid with the responsibilities of a high-level job. 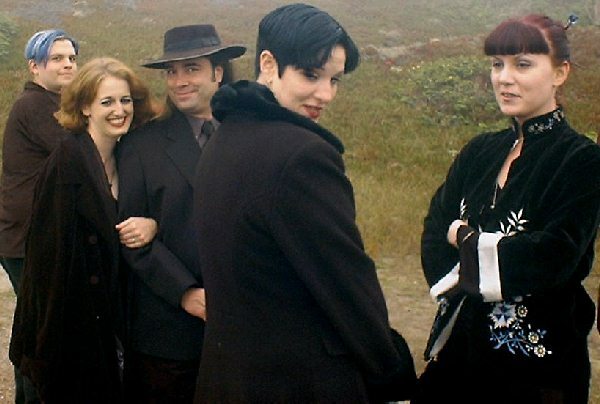 "Goths are usually pretty smart people, for the most part, often getting jobs that are of a higher calibre," says Nancy Kilpatrick, author of The Goth Bible (St. Martin's Griffin). Kilpatrick interviewed nearly 100 Goths for her book about the subculture, which is centred on dark fashions, emotive music, creativity and introspection. The Montreal author says the Goths she talked to hold all kinds of respectable jobs. One was a senior vice-president of retail, another was a dentist. Then there were the university professor, family therapist, teacher, research scientist, archivist and translator. "The perception goes against the reality," she says. But corporate Goths often feel they have to keep their dark side a secret in the workplace because of the stigma associated with the aesthetic. Every weekend, hundreds of Toronto Goths head out for a night of drinking and dancing. On a typical Thursday night at the Velvet Underground nightclub on Queen St. W., a handful of Goths are breaking gender roles on the dance floor. Girls in military boots and torn fishnets stomp to thunderous beats while men wearing heavy black eyeliner dance with dramatic, swooping arms. Others stick to typical gender personas but wear outfits that fall outside of the usual fare. There's Nikki the news producer in a purple vinyl top, Henry the computer programmer in the shiniest of shirts, and an accountant named Eric in military dress (not their real names). All too often, Kilpatrick says people fear what they do not understand. Early reports of the Columbine High School shootings in 1999 indicated that the assailants were Goths. While the media later corrected this fact, Kilpatrick says she believes many were left with the impression that Goths are violent. "I've had people make assumptions about me that I must not have a brain in my head, based on my clothes," says Jane, who asked that her real name not be used in the story. Jane manages clinical drug trials, a job that draws on the knowledge she gained as a biology student at the University of Toronto. The fact that she wears short kilts and vinyl corsets on the weekend doesn't impair her job performance, but she's not entirely convinced her co-workers would understand her Gothic lifestyle. "I never judge someone based on what they wear," says 56-year-old Alan Rimmington. "But I do judge their judgment." A senior development consultant for the Ministry of Tourism, he frequently interviews people for a wide range of jobs. Rimmington, who typically wears a suit jacket to work, says he'd never make assumptions about someone's intelligence based on their appearance. He says he sees corporate apparel as a way of showing respect for your customers and your co-workers. "Until such time as Goth becomes the standard I don't believe it's appropriate," Rimmington says. Chris Klus, a human resources consultant in Ottawa, says corporate dress has relaxed considerably in the last five years. But Klus agrees that it's important that an individual's appearance reflects that of his co-workers. "It's probably best that everyone keeps their private life private," Klus says. "You have to adjust to the culture of that society in which you will be working." After getting a job as computer systems manager, John Coughlin of Cold Spring, N.Y., tried to bring elements of his Gothic look to work. But his long, pointy black nails scared some of his clients, he says. Coughlin's struggle to integrate the two parts of his life inspired him to set up an online support group for corporate Goths. "I realize the Gothic look can be a little spooky but if you talk to the people you usually find that they are more reflective than the average person," he says. Coughlin was surprised to learn just how many people like him were out there. Today, corporateGoth.com has nearly 1,000 members. Some are there to share clothing tips, others swap stories about their corporate co-workers or network with likeminded corporate Goths. The site's survival guide suggests Goths gradually introduce gothic pieces into their corporate wardrobe — but nothing too extreme. "Establish mutual respect and then slowly show your true colours (or in this case lack of colours! )," suggests the guide. "Dress and act appropriately for meetings. Sometimes you need to make sacrifices to stay ahead." Those kinds of tips have been helpful to people such as Eric the Toronto accountant. He plays the role of bean counter during the week, wearing traditional, three-piece blue suits. On Saturday nights, however, he puts on his big, black boots and military uniform and heads to a nightclub that caters to the Gothic crowd. "No one suspects. I don't talk about my social life at work," Eric says. "They must think I'm very boring!" But Eric says it's important that he keep his work and social life separate, lest he risk limiting his accounting career. "The ideal qualities for accountants are conservatism, consistency and reliability. We're not supposed to shock or surprise," he says. Eric says his biggest problem is trying to figure out what to wear on casual Fridays. He can cope with the suits during the rest of the week. But no matter what, Eric says he just can't bring himself to wear a golf shirt.